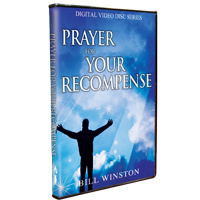 In “Prayer for your Recompense,” you will learn the importance of this special season of justice for the Kingdom of God and for your life. Dr. Winston concludes his teaching concerning your divine recompense with a powerful prayer and prophetic declaration of victory and restoration received directly from God. Use the revelation shared in this important teaching to pray for your recompense and boldly proclaim what is rightfully yours!